March 25, 2019 – In this episode, our time machine travels back to post-World War 2 Israel. When we arrive, we’ll follow its return to statehood — beset by enemies on three sides and their back against the sea on the fourth — through the eyes of two fictional brothers and the woman they love. 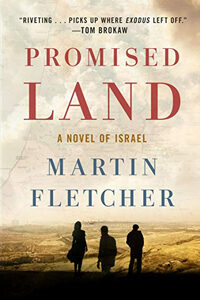 Our guide on this journey is Martin Fletcher who brings us Promised Land: A Novel of Israel . In it, we meet characters shaped in very different ways by the darkness of the Holocaust. Peter protects Israel as an agent for the Mossad, his kid brother Arie builds it as a businessman — and then there’s Tamara, an alluring Jewish refugee from Egypt, seeking a new life in the reborn nation. The love triangle of these three vivid characters spans the first twenty years of Israel’s modern existence, as war, intrigues and jealousy threaten to tear their lives — and the struggling nation — apart. You’ve seen Martin Fletcher’s work as NBC News Bureau Chief in Tel Aviv and he’s earned recognition with the National Jewish Book Award, a Columbia University DuPont Award, several Overseas Press Club Awards, and five Emmys. His books include The War Reporter, Jacob’s Oath, and Walking Israel. His latest novel is the first in a trilogy, each covering two decades, bringing readers up to the president day. Visit our guest at MartinFletcher.net or toss him a like at Facebook.com/MartinFletcherFPage.